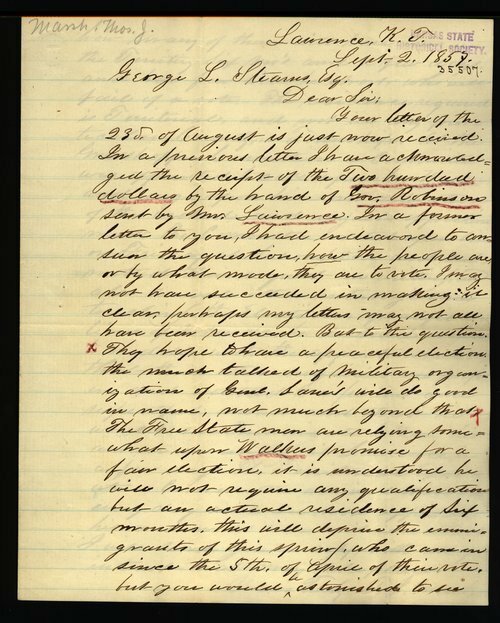 This letter from Thomas J. Marsh to George L. Stearns regards the ways in which Free State men will vote in the upcoming elections. Marsh claimed that the Free State men relied on Governor Robert Walker's promises for a fair election, but could not rely on the military organizations of General James Lane. Marsh also detailed the request submitted to Governor Robert Walker by the Territorial Executive Committee regarding territorial elections and the qualifications of voters. A searchable, full-text version of this letter is available by clicking "Text Version" below.